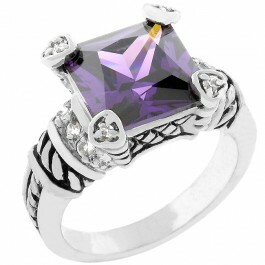 Amethyst Eyes features a princess cut amethyst CZ center encased with beautiful prongs that contain inlaid CZ. The body of this ring is rhodium bonded in a cable style that is rich with designer appeal. Each shoulder features a strip of pave CZ that accentuate the piece and give it a perfect balance of carat and design. White Gold Rhodium Bond is achieved using an electroplating process that coats the item with heavy layers of rhodium, a close cousin of platinum that costs three times as much, which gives this piece a platinum luster.